Would you like to be a sponsor of FinnFest USA '99? Finnish Culture and the Finnish Community by supporting FinnFest USA '99! The theme of FinnFest USA '99 is "Roots and Wings." Our individual supporters are our “roots”. Our corporate sponsors give us our “wings”. Together they have given us the support to provide the quality programming you see at FinnFest USA ’99. Visit the home pages of our corporate sponsors. These companies support Finnish culture. Let us support them through our business. Become familiar with the organizations that promote Finnish culture in the United States and consider joining them. Finally, special thanks to the individuals who have invested in FinnFest USA ’99 and Finnish culture with their personal donations. May your investments provide you with great returns of satisfaction. FinnFest USA '99 thanks all of the following . . .
West Coast Finnish American Singers Assoc. ... To discover more about our wonderful sponsors, please see the detailed messages listed below. Thankyou for your support! FinnFest USA '99 is proud to present its Chief Sponsor: Finnair! What finer wings for a FinnFest with a theme of Roots and Wings than the national Finnish airline! Finnair is one of the most experienced airlines in the world, thanks to the world-leading technical standards that the airline maintains. They have been flying regular scheduled flights for 75 years and now have a superior quality fleet of 57 aircraft, including state-of-the-art wide-bodied MD-11 aircraft. - Their new charter fleet comes from Boeing and you will have a chance to combine a trip to the Museum of Flight on your FinnFest visit in Seattle. There are no better connections between Finland and the United States than Finnair, the dependable Finnish airline and the dependable sponsor of FinnFest USA '99! Acura of Lynnwood, Washington is a dealership that has always taken extra special care of its Finnish customers. It is the right destination for you when you want expert and friendly service. Acura was founded over a decade ago, and their automobiles have been lauded for their compelling combination of gratifying comfort, meticulous quality and impeccable engineering. Visit their dealership and visit their Web Site. Make sure to thank them for their support of FinnFest. So you need a vacation. Not of the usual sort. A vacation that blows out the cobwebs, jump-starts the spirit, and puts your senses in a state of high alert. The Wind Surf will take you there. The lucky winner of the FinnFest USA '99 Raffle will be sailing away on a seven-day Caribbean cruise in 1999! It will truly be an experience 180° from ordinary: privacy, privilege, pampering, play. . .
Visit Windstar Cruises on their Web-page, windstarcruises.com. You may want to have the same experience yourself. "The Windstar Experience"
What are Finns known for but their expertise in forestry! Ekono is a consulting company that brings the Finnish knowhow close to American and Canadian customers. For consulting expertise in engineering, forestry and waste management, please contact them at 11061 NE 2nd, Suite #107, Bellevue, WA 98004, or call 1-(425)455-5969. Visit their new Web-site at www.Ekono.com. FinnFest USA '99 is grateful for Ekono's generous financial support and the use of the Ekono conference room as the Board room for FinnFest! Seattle is sometimes known as "The Jet City" thanks to the fact that it is home to the Boeing Company, the world's largest commercial airline manufacturer. Boeing is the largest employer in the Seattle metropolitan and Puget Sound region, and thus plays a key role driving the economy of the region, and of the nation, with its world-leading commercial and military aerospace and information systems products. In April of 1999, Finnair took delivery of its 5th leased, Boeing built plane for their Charter Fleet. FinnFest USA '99 is grateful for Boeing's generous financial support! IKEA is a world-wide supplier of solutions for better living. Our vision is to offer a wide range of attractive and functional home furnishings at affordable prices. Most beautifully designed home furnishings are created for a small part of the population - the few who can afford them. IKEA has taken a different path  to side with the many. That means responding to the home furnishing needs of people throughout the world. People with many different needs, tastes, dreams, aspirations...and wallets. People who want to improve their home and create a better everyday life. For IKEA, helping create a better everyday life means good design, good function and good quality with prices so low that as many people as possible can afford them. FinnFest USA '99 is grateful for IKEA's generous financial support! Contact SUUNTO USA at: 2151 Las Palmas Drive, Suite G , Carlsbad, CA 92009; telephone 800-543-9124 / 760-931-6788 or Fax: 760-931-9875. Contact us on-line through our Email address: info@suuntousa.com, or visit our Web-site at SuuntoUSA.com. FinnFest USA '99 thanks Sampo Corporation and its President, Carl Jarvie, for their generous sponsorship of FinnFest's world premiere Kalevala based musical "The Sampo". 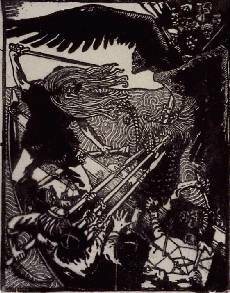 Their support makes it possible for FinnFest to present the famous Kalevala story of the Magic Mill in a musical setting. The word "sampo" comes from a legend of the Finnish epic Kalevala about a magical stone that could bring fortune and prosperity. What could be more appropriate than having Sampo Corporation sponsor our world premiere musical by the same name. The Graphic Arts Center Supports FinnFest99! Visit them for your printing and graphic advertising needs at their Lower (south-side) Queen Anne Hill location, at: Graphic Arts Center, 200 1st Ave W # 506, Seattle, WA 98119-4219  Phone: 206-284-3410. FinnFest USA '99 is grateful for Graphic Arts Center's generous support in providing the printing for this year's FinnFest USA Program Book! Participation of companies like the Graphic Arts Center help make FinnFest '99 possible. Andersen Consulting is a leading global management and technology consulting firm whose mission is to help its clients change to be more successful. (Annual Report 1997) Andersen Consulting is helping FinnFest USA '99 be successful through its sponsorship of FinnFest's Virtual Finland, a concrete demonstration of the wings of today's technology. Bank of America is the new banking company created by the merger of Bankamerica and the NationsBank. FinnFest visitors can take advantage of nearly 14,000 Bank of America VERSATELLER and NationsBank ATMs in 22 states and the District of Columbia. Bank of America is the biggest bank in the state of Washington. You know where to go if you need more money for your FinnFest "Tori" (market place) purchases. Consulate General of Finland - Los Angeles FinnFest USA '99 appreciates the support and assistance given by the Consulate General of Finland in Los Angeles. They provide a solid bridge between Finland and the West Coast. Their expertise in government, technology and trade enable them to provide information and services to everybody interested in Finland. Nokia, the Finnish telecommunications giant, is known as a company Connecting People. A global company whose key growth areas are wireless and wireline telecommunications. A pioneer in mobile telephony, Nokia is the world's leading mobile phone supplier as well as a top supplier of mobile and fixed telecom networks and services. Nokia also creates solutions and products for fixed and wireless datacommunications. Multimedia terminals and computer monitors round out our expertise in communications technology. For many companies, it's a challenge to simplify these technologies of the future and still offer feature-rich products. At Nokia, we accept it as our everyday goal. After all, at Nokia, "Connecting People" is not just our slogan, it's our business. FinnFest USA '99 thanks Nokia for helping FinnFest connect the Finnish American community and all friends of Finland. We hope all FinnFest visitors get to know Travel Time , the official travel agency of FinnFest USA '99! You can get help in English or Finnish, with travel arrangements to FinnFest '99 in Seattle, with exciting side tours to take in connection with the festival, as well as help on arrangements for airline, hotel, and rental car selections. For those interested in extending their visit to the great Pacific Northwest, Travel Time also offers cruises which sail before and after the festival. Travel Time would be happy to be your official travel agency at all times! A master of line and color, Annikki Karvinen exhibits an independent and creative spirit in her fashions. Translated, this means "Annikki style," a mixture of Finnish heritage blended with international influences. Beginning in 1968, her innovative and colorful cotton poppana jackets, with their whimsical appliquéed patterns, captivated buyers in Finland. Thereafter women in Scandinavia, Europe, North America and Japan discovered her delightfully wearable clothes and snapped them up, reveling in their comfort and color. Currently, the company has two lines: Anno- by Annikki Karvinen represents trendy, feminine and simple lines, while the Annikki Karvinen Collection is the company's traditional, classic designer line with hand-woven materials, lavish detail and unusual colors. FinnFest USA '99 is proud to have Annikki Karvinen, Inc. as a sponsor and feature fashion-line at this year's FinnFashion Show '99! This year's FinnFest USA blessed to offer a demonstration of "Sähly": European-style Floorball, courtesy of Exel Oyi  a Sponsor Fund company. Exel´s business areas are industrial applications and sports & leisure. In 1960, three chemists founded a company that manufactured detonators, whose name "Exel" came from the words 'explosive electronics'. Product development took the company quickly to sports in the 1970's, including skiing, windsurfing, hanggliding, hockey, floorball, baseball and golf. In addition, they offer hi-tech tube and latice-works for industrial application. Contact them at: Exel Oyi, Kivaran tehdas, Muovilaaksontie 2, FIN-82110 Heinävaara, Finland, tel. +358-13 73711, fax +358-13 737 1500. Or, visit their Web-site at Exel.com, where you can find, among many other things, the latest news and innovation in the world of FloorBall!.. FinnFest USA '99 is proud to have the sponsorship of the Northwest Chapter of the Finnish-American Chamber of Commerce. The Finnish American Chamber of Commerce was founded to stimulate and promote economic development, trade, and investment between the United States and Finland. The FACC serves as the premier vehicle for business networking and information exchange within the Finnish-American business community. Membership in the FACC is open to all individuals and organizations interested in building economic partnerships between Finland and the United States. The FACC provides its members with on-going opportunities to meet other individuals and firms involved in Finnish - American business relations. With the assistance of Finland's Trade Commissioner Offices, the FACC fields and channels hundreds of business inquiries each year wishing to establish commercial contacts. To join the Finnish American Chamber of Commerce, visit their Web-site at FinlandTrade.com. SAS  Scandinavian Airlines has always had a mission to make the world more accessible to Scandinavians, and Scandinavia more accessible to the world. The quality of life in Scandinavia is distinctive, and is the most unique and attractive aspect of the Scandinavian tradition. In modern times, this tradition has been enriched by a pro-active approach to the environment that has become a model for many other countries. Through the framework of Star Alliance, SAS is dedicated to providing passengers with the best in Scandinavian care and comfort, actively participating in innovative solutions that make travel safer, easier and more convenient. Our operations and our faith in the future are based on the vitality of the Scandinavian tradition and the attractiveness of Scandinavia for both business and leisure travellers. US WEST, providing integrated, one-stop communications solutions to over 25 million customers nationally, offer products and services including: local telephone services; value-added custom calling services; long distance services within specified calling areas; high-speed Internet and data networking; wireless PCS; print and electronic directories; local phone interconnections to interstate long-distance companies; operator services, and video services in limited markets. Rooted in the former Bell Telephone System, U S WEST offers customers over a century of innovation in communications. From the original "talking wires" to today's high-speed data networks, U S WEST is continuously improving its products and services to make life better and easier for millions of customers. FinnFest USA '99 wishes to thank BCSR Inc. for their support in providing the equipment necissary to make the "Virtual Finland" computerroom at FinnFest'99 a reality. BCSR's goal is to cultivate a close working relationship with your company, to provide you with the equipment which best suites your needs and budget. In the greater Puget Sound area, see BCSR for all your computer rental needs. FinnFest USA '99 wishes to thank Bob Larson and Associates for their wonderful support. Bob Larson and Associates was instrumental in the implementation of the database for this year's festival. Without companies like them, FinnFest USA '99 would not have been possible. FinnFest USA '99 wishes to thank Gerry Luoma Henkel, maker and seller of Kanteles & other Finnish folk music instruments, for the generous donation of wonderful musical instruments, such as the Kantele, to be featured at this year's festival. FinnFest USA '99 is thrilled to have the Muumi and Moomin Valley coming to Seattle in July. Children all over the world love Moomins, so be sure to bring the "little ones"! This year's FinnFest includes a wonderful series of Moomin shows and activities that will be sure to delight. It'll be an event they won't soon forget! In 1999, the exhibitions of the Moomin Valley museum in Tampere will highlight the scope of Tove Jansson's work. The Moominvalley museum has a permanent exhibition of Moomin illustrations. Tove Jansson's illustrations will be viewable at the exhibition in a multimedia show called "The Original Moominvalley", as wll as a selection of articles. Moominvalley can be contacted at: MOOMINVALLEY, Hämeenpuisto 20, P.O.Box 487, 33101 Tampere, FINLAND; Tel. + 358 3 3146 6578, Fax + 358 3 3146 6567. Or visit our Web-site at http://www.tampere.fi/muumi/moomin.htm. 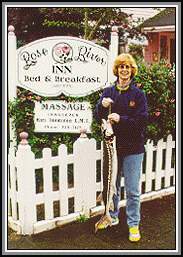 Rose River Inn Bed & Breakfast  Astoria, Oregon. "The elegance of bygone era" is yours to enjoy while staying in this 1910 home in historic Astoria, Oregon. A gourmet breakfast is served by your host, Jaakko, former Finnish Olympic runner. Have your wonderful massage by your hostess, Kati, a licensed massage therapist also from Helsinki. Enjoy Finnish SAUNA with Columbia River view or relax by the fireplace. Contact them at ROSE RIVER INN B&B, 1510 Franklin Ave, Astoria, Oregon 97103. Long distance call toll-free, (888) 876-0028. Local calls, telephone (503) 325-7175, or Fax (503) 325-7188. You can also send e-mail to roseriver@moriah.com. Find more info about the Rose River Inn on Travel Guides, Moriah Border to Border Bed & Breakfast Directory, or 1st Traveller's Choice. View MapQuest. Vitamilk Dairy, Inc., locally owned and operated, was founded by Edwin Teel during the Great Depression. Our milk comes from farms in the Puget Sound area, many of whom have been doing business with Vitamilk for generations. We work closely with these farms to maintain the highest quality standards possible. When you purchase Vitamilk products, you help support dairy farmers right here in the Puget Sound area, insuring the health of our local agricultural industry. So when you want quality, farm fresh milk and dairy foods for your family, manufactured right here in the Pacific Northwest, you don’t have to look any further than your own backyard, Vitamilk Dairy. Contact us at: Vitamilk Dairy, Inc., 427 N.E. 72nd St., Seattle WA 98115. Telephone 206.524.7070 or Fax 206.522.0844. Be sure to visit us on the web at http://www.vitamilk.com. Water matters. The water used in Finlandia Vodka is so pure that it requires no additional treatment. Finlandia is the only premium vodka in the world that can make this claim. This unique, crystalline spring water is a legacy of the Ice Age. Aeons ago, as vast glaciers withdrew from the region known today as Finland, they left in their wake great deposits of sand and gravel called moraine. Moraine is nature's perfect filter. And it is from artesian springs welling up from deep beneath this glacial moraine that Finlandia Vodka is created. Water matters. Taste Finlandia, and you will know. FinnFest USA '99 is proud to feature Finlandia Vodka at its Banquet Social Hour. FinnFest USA '99 wishes to thank Xpedx of Seattle for their wonderful support in providing the paper stock on which the wonderful FinnFest USA '99 Program Booklet was printed. Without companies like them, FinnFest USA '99 would not have been possible. Finn Ware of Astoria, Oregon - "Siskojen Kauppa" donated a handsome Tapio Wirkkala centerpiece bowl as the second prize in the FinnFest USA '99 Raffle. Please contact them for all Finnish and Scandinavian items, ranging from crystal to books and sauna supplies. You can order their catalog by calling 1-800-851-FINN, or visit them in Astoria, Oregon at 1116 Commercial Street. A Five-Heart Waffler awaits the third prize winner at the FinnFest USA '99 Raffle, courtesy of Scandinavian Specialty Products, Inc. Find them in Seattle's Ballard/Crown Hill district at 8539 - 15th Ave. N.W., Seattle, WA 98117. Call them on (206) 784-7020 when you are looking for Scandinavian taste delicacies, or other Scandinavian items. Broadview Electric is a supporter of FinnFest USA '99! See them for your commercial and industrial electrical needs. They are located in the north Fremont community known as Phinney Ridge, east of Ballard, only a short distance north of Seattle's famous Woodland Park Zoo. Their address is 7821 Fremont Avenue North, Seattle, Washington 98103-4736 USA, and telephone number is (206) 789-6900. FinnFest USA '99 is grateful for the support of local businesses like Broadview Electric. Brooks Sports, Inc., known worldwide as makers of performance running shoes and apparel, is committed to manufacturing high quality performance products that fit and look great. Brooks footwear and apparel can be found at your nearest sporting goods or clothing store which sells quality athletic equipment. Or, visit their on-line store at BrooksSports.com. In the Puget Sound region, they are headquartered at 11720 North Creek Parkway North Bothell, WA 98011-8223 USA. In Finland, contact them at Kesko Oy Sport Division, Satamakatu 3, 00160 Helsinki 16, 0-198-2563. For fun, you can get a taste of the sights you can see on your visit to FinnFest USA '99 this July, by taking the "Tour of the Emerald City", courtesy of Brooks Sports. FinnFest USA '99 wishes to thank Harbor Machine & Fabricating Inc., of Hoquiam, Washington, for their support. Harbor Machine  general machine fabrication & welding, specializing in maintenance & repair and manufacturing of industrial equipment: Steel fabricators; Welding; Shake & shingle equipment; Cylinder repair; Hydraulic equipment repair; Marine gear; Logging equipment; Log truck repair; Over 30 years experience! See them at the corner of 30th and Industrial Road in Hoquiam: 710 30th, HOQUIAM WA 98550-4238; telephone (360) 533-1188. InnoDev Oy. is like its name - innovative and creative in development processes - a small but a high quality consulting agency offering its professional services to business companies and other learning organizations. Knowledge Management is the foundation for continuous improvement of improvement processes in today's world and in the future! We are Risto Kettunen and Marja Laesvirta with almost thirty years of challenging work experience both in Finland and abroad. Visit us at our Web-site, www.innodev.fi. The Olson Lumber Corporation, supports FinnFest USA '99!. See them for your building and hardware needs. They are located on the corner of Aurora Avenue North (aka, Highway 99) and 93rd Street in north Seattle, at 9300 Aurora Avenue North, Seattle, Washington 98103 USA. Their telephone number is (206) 523-7777. FinnFest USA '99 is pleased to recieve the gratious support of the "Scandinavian Hour" each week on KBLE, AM 1050 on your radio dial, in Seattle. Listen to Ron Olson & Doug Warne each Saturday morning at 8:30AM to 10:30AM. Or contact Ron and Doug at P.O.Box 833, Mercer Island, WA 98040. FinnFest USA '99 is pleased to recieve the support of Iron Mountain, of Redmond, Washington. FinnFest USA '99 would like to thank Kinko's, Inc., located at 2nd Ave. & Union St. in downtowne Seattle, for their support. FinnFest USA '99 is pleased to recieve the support of Pierce Leahy, King of Prussia, PA.
FinnFest USA '99 is pleased to recieve the support of Stokes Lawrence, P.S..
FinnFest thanks an Anonymous Donor! Indicated an "in-kind" sponsorship or donation. This page created by CybrrCat Productions! for FinnFest USA '99! Last modified 10 July, 1999 by Matt Wirkkala (webmaster).